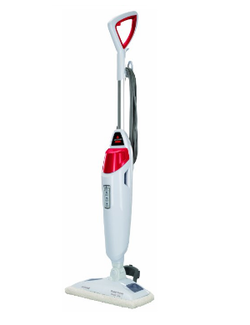 Pros: A reliable steam mop, boasting many satisfied customers - that heats up quickly and is easy to use. Cons: No hand-held attachments makes this mop unsuitable for cleaning anything except floors. Our Advice: If you just need to clean floors this the best value product. Pros: A low cost, popular product, that includes attachments that will allow you to clean windows and hard to reach places too. Cons: This is not the sturdiest machine, and some unlucky people will need to invoke the (2 year) warranty. Also, changing attachments can prove difficult – especially for people with weak or arthritic hands. Our Advice: This is the best 'affordable' steam mop, but should be avoided by anyone concerned by our 'Cons' section. Pros: Certified effective against dust mites by the British Allergy Foundation, this steam cleaner is perfect for deep cleaning floors, and is agile enough to reach difficult to access places. Cons: It is significantly more expensive than the two other steam mops we recommend. Our Advice: For anyone who needs a level of cleaning over and above what the average steam mop can provide – this is the product to purchase. A Steam Mop is the modern equivalent of a traditional mop and bucket of warm water. In the 'old days' you'd dip the mop in the bucket, wipe the floor, rinse the mop in the bucket, then squeeze water out of the mop. Steam Mops carry their water with them, they heat that water and allow the mop to wipe a surface with steam. The steam helps to dislodge any dirt and kills 99% of all germs into the bargain (in a very ecological way, because no chemicals are used). The remnants of the steam will generally dry quicker than the water left behind by a traditional mop. 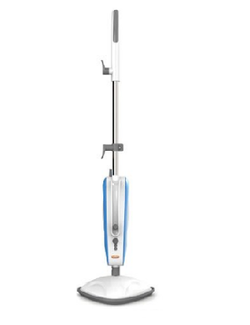 What to Look for in a Steam Mop? Ability to clean the floor: This is the mop's core function, and some mops do this better than others, even when of supposedly similar specifications. The Steam Mops we recommend provide a decent level of cleaning ability for their price. High pressure bar Steam Cleaners like the Polti Vaporetto Eco Pro 3.0 provide the deepest level of cleaning (but are more expensive). Versatility: You might require something whose attachments allow you to steam clean shower units, windows and car interiors too... or you might just want to clean the floor. Amount of water carried: If you have floors with a large area you might prefer a model with a higher water carrying capacity, so that you do not need to refill it whilst cleaning. 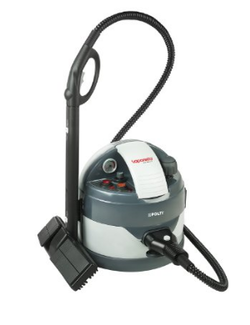 Weight: The models we recommend are not too cumbersome or heavy (or can be wheeled as the Polti), however some larger powerful Steam Cleaners can exhaust those who use them for extended periods of time.